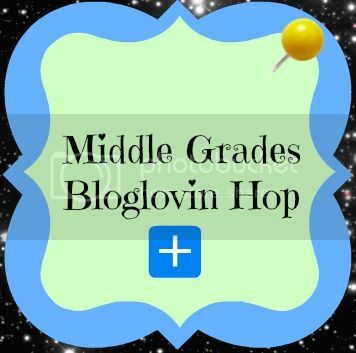 For Throwback Thursday today I wanted to link back to my post about the Middle Grades Bloglovin Hop I created a while back. There have been several new entries to the blog hop that you may want to follow! 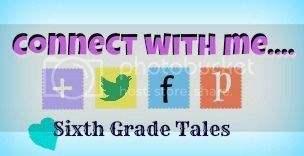 If you are a 5th-8th grade teacher that hasn't yet linked your blog up, now is a great time! 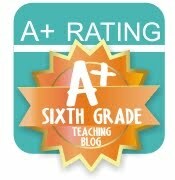 I love seeing new middle grades blogs added. 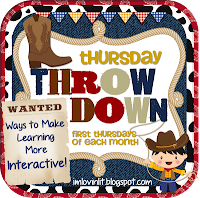 I also wanted to participate in Throwdown Thursday where we talk about how to make learning interactive. 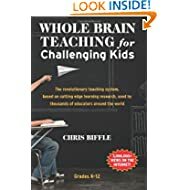 I am very excited this year to be trying out Whole Brain Teaching. This system makes learning more interactive by having your students using gestures and teach each other your lesson constantly while you are instructing. You can order the book on Amazon in paperback or Kindle. I highly suggest this book if you are a new teacher or looking for a new way to get students engaged while following directions. Last year one way I made discussions more interactive was by having students use discussion posters. 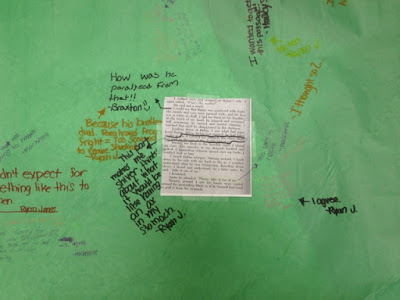 I took bulletin board paper and gave each group a short passage from the novel that I wanted them to discuss. Each group member had to comment on the passage on their paper. After each person had responded to the passage then they had to respond to what another group member said. They really enjoyed this but it takes some modeling to get them to be able to respond to each other how you would want them to. To make sure everyone is participating you can have them write their name by the comment or give each group member a different color marker. Finally don't forget about my upcoming giveaway! I'm still looking for more people to donate something from their TPT store in return for referrals to their blog or store. If you are interested leave a comment or use the contact form in the right side bar.